This weeks Episode for my Podcast can be found HERE, so if you wish to listen to it, please do. 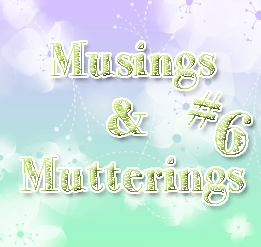 For Musings & Mutterings this week, I undertake a more serious topic that is very familiar to myself. I start off with my usual, updates and Idol news and such, however the second half goes into the heavier topic that is Bullying, and as usual, I make little to no sense, though somehow I managed to get through it. Whether you can hear it or not, towards the end, I was almost crying. Almost. It's not a light topic, nor one to be taken lightly, so I apologise if I didn't do well with this podcast - finding the words and phrasing everything was pretty difficult, especially when trying to give advice, because I don't think I am the sort of person who should even give out advice. Still. I tried. I did neglect to say that, with Bullying, do NOT take action yourself against the bully, physically or verbally - that could result in you becoming a bully yourself. I've experienced that, and it is not good, so just try and get as much help as you can. Do NOT keep quiet, please. I've realised that keeping quiet means you suffer as a result, and telling others helped me a lot, because I knew I had someone on my side. This was a more serious Podcast, and it was hard to talk about at points, but I am glad I made it. Please spread the awareness of Bullying and spread the word about getting help. The more help, the better. If you have a Topic Suggestion for the next Podcast, please let me know! Having a Topic means I have some more structure to my Podcast, and gives me something to talk about, so don't be afraid to suggest something! Thank you. Until next time, and again, thank you. Thanks for another fine podcast, Chii, and for being so brave as to share your bullying experiences and advice. I really can't stress enough how much I want to thank you for taking the time to discuss such a serious and important topic. It sounds to me like you really had a hell of a time of it in school, as many of us do, and just hearing you talk about it reminded me how ugly it can get. My heart went out to you. It really pissed me off when I heard about that horrible teacher who not only didn't help but essentially aided and abbetted the bully by trying to undermine your support for each other. Horrible, despicable excuse for a human being! Some would say worse than the bully, because what they did was a betrayal, and that behavior is in no way acceptable particularly in someone entrusted with the care of school children. Did you get a sense that the teacher was some kind of sadist? Because you'd have to be to do what they did, don't you think? I've copped my fair share of bullying too, but I would say it wasn't anywhere near as bad as what I've seen others have to endure. It may not always be the case, but the ones who were doing it in our school were the ones who were struggling at home. It makes so much sense that those whose home is no haven and who have no choice but to endure dreadful parents go on to do these things. People with rock bottom self-esteem clamour for some shred of control in their life and, like wounded animals, lash out at others who bear them no ill will. I applaud the idea of not escalating matters to physical violence if it can be helped. Violence always begets violence, and hate breeds hate. It was heartening to hear that you were actually able to turn a bully into an ally, Chii. I wonder if this was someone who was a bit of a lone wolf. It's hard to imagine someone who is part of a clique changing their behavior, as part of the bully M.O. is to put on a show to impress a group. They crave the validation. If I have one piece of advice to add for those enduring bullying, and this can be helpful not just in the school environment but throughout all of life, it would be to see what you can do to cultivate ties with more prominent and powerful allies. Having people who can come to bat for you when you really need them to throw their weight around can be a real game changer. Those very same people aren't going to be motivated to go the extra mile if they don't know you well enough to care all that much. So in the school example the most powerful ally is the headmaster. They're more likely to be sympathetic to your situation and thus lay down the full measure of the law on your behalf if you're involved in school at other levels beyond just showing up for classes. If there's a school council and you can attend - do so. If there are other extra-curricular activities you could sign up for that would garner further notice and consideration from the faculty, try that. Cultivating ties in the community is a good insurance policy against being trod on in life.